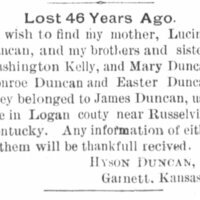 They belonged to James Duncan, near Russellville, Logan County, Kentucky, and were separated 46 years ago [ca 1846]. 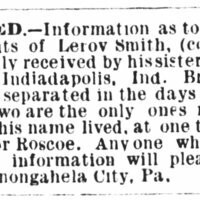 Smith, of Indianapolis, Indiana, is searching for her brother. They were separated during slavery. 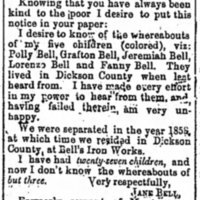 Bell had 27 children but only knows the whereabouts of three. 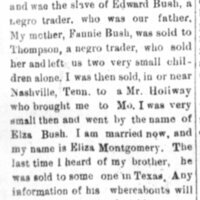 She had been enslaved by Montgomery Bell, at Bell's Iron Works in Dickson County, Tennessee. 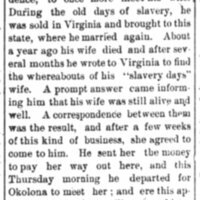 Lee Barton, of Houston, Mississippi, was separated from his wife in Virginia by sale 38 years earlier [ca 1853]. He found her in 1891 and they remarried.